Recently, we were invited to conduct a joint talk with a UX designer, Andrew from Viki on Improving communications between Design and Development for Singasug. The main focus of the talk was to introduce AngularJS and elaborate on how it help to improve collaboration between developers and designer from both sides of view. To illustrate the topic, we work together on revamping the Pet Clinic Spring sample application. Over one month of working remotely, mostly on spare time, we have managed to refresh the Pet Clinic application with a new interface, which built on AngularJS and Bootstrap. Based on what we have been through, we delivered the talk to share what have been done with Spring community. The project was initiated last year by Michael Isvy and Sergiu Bodiu, the two organizers of the Singapore Spring User Group. Michael asked our help to deliver a talk about AngularJS for the web night. He even went further by introducing us an UX designer named Andrew and nicely asked if we can collaborate on revamping the Pet Clinic application. Feeling interested on this idea, we agreed to work on the project and delivered the talk together. We set the initial scope of the project to be one month and aimed to show as much functionality as possible rather than fully complete the application. Also, because of Andrew involvement, we take this opportunity to revamp the information architect of the website and give it with new layout. The biggest problem we have to solve is geographic location. All of us working on spare time and can afford limited face to face communication. Due to personal schedule, it is difficult to setup a common working place or time. For discussing about the project and planning, we only scheduled a weekly meeting during weekend. To replace direct communication, we contact each other through Whatapp. We hosted the project on Github and turned on the notification feature so that each member is informed after any check-in. Even though there was a bit of concern at the beginning but each member play their part and the project progressed well. To prepare in advance, we converted SpringMVC controllers with Jsp view to the Restful controllers. After that, Andrew showed us the wireframe flow that laid the common understanding of how the application should behave. Based on that, we built the respective controllers and integrated with html templates Andrew provided. After half of the project time, Andrew picked up some understanding about Angular directive and be able to work directly on the project source code. That helped to boost our development speed. When the project has been through half of the timeline, Michael came back to us and asked if it is possible to make the website functional without the Restful API. He think that would help designers to be able to develop html template without deploying it into an application server. We bought into this idea and provided this feature for the application. By turning on a flag, the AngularJS application will no longer make any http call to server. Instead, the mock http service will returned the pre-defined static Json files. After one month, we have a new website with beautiful theme that look like a commercial website rather than sample application. The new Pet Clinic is now a single page application that accessing Restful API. We did figure out an effective way of working remotely even when we did not know each other before the project started. We also found many benefits of building web interface with AngularJs. That is what we want to share with you today. If you are new to AngularJS, think of it as a new MVC framework for front-end application. MVC is a well known pattern for server side application, but it is applicable for front-end application as well. With AngularJs, developer build a model based on the data received from server. After that, Angular will bind the model data to the html controls, displaying output on screen. 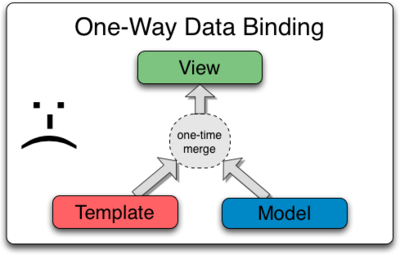 The good thing here is AngularJs provide the two-way binding instead of one-way binding. In this case, if user update the value in the html control, the model is automatically updated without developer effort. Look at the above template, if we take out all Angular directives, which start with data-ng or ng, we should have back the original html template. The only exception here is the directive data-ng-repeat, which function like a for loop that help to shorten the html code. So far, that is the effort to Angularised one owners page template. The above example is mostly about showing data, but if we replace the tag <p/> with <input/> then users should be able to edit and view the owner at the same time. We have done evaluation on AngularJS before adopting it and we have evaluated it again after using. To recap our experience, we will share some benefits and issues of AngularJS. Obviously, one need to introduce Restful API to work with AngularJS. Given the changes happened in this industry over last decade, Restful API is slowly but surely will be the standard practice for future applications. In the past, a typical Spring framework developer should know JDBC, JPA, Spring, Jsp in order to develop web applications. But they are no longer enough. At first, there are some big players like Twitter, Facebook or Google that introducing the APIs for third-party web applications to integrate with their services. Later, there is a booming trend of mobile applications that no longer render UI based on html. Because of that, there is an increasing demand for building application that serving data instead of serving html. For example, any start-up that want to play safe with will start with building Restful API before building a front-end application. That can save a lot of effort if there is a need to build for another client rather than browser in the future. Because we adopted Restful API from development benefit, it is important for us to showcase the ability of running Angular application without back-end service. Because AngularJS injects the modules by declaration, we have a single point of integration to configure the http service for the whole application. This look very favorable, especially for a Spring developer, because we have better control over the technology usage. Jsp by nature is only for viewing. Changing of data happened by other methods like form submitting or Ajax request. 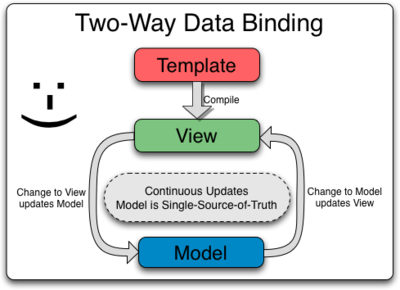 That why most of us think the MVC pattern only include one-way binding for displaying view. That not necessary to be the case if you remember desktop applications. For front end, MVC is not that popular. Some developers still like to manually populate values for html controls after each Ajax request. We also do but only sometimes. Some other times, we prefer automation over control. That why we love AngularJS. As any other MVC framework, AngularJS provide a model behind the scene for each html control. But it is a Wow factor to have it reversed way, when the html control update the model. Think about it practically, sometimes our html controls are inter-related. For example, updating the value of country from the first drop down suppose to display corresponding states or provinces in the next drop down. AngularJS allows us to do this without coding. I think the biggest benefit that AngularJS offer is custom directive. We adopted AngularJS because of two-way binding but custom directive is what make us committed. Directive captured our interest at first sight. It is a clean solution for the long term problems that we face, the continuity problem and tracking problem. The code between opening and closing of for loop helps to render one element. Whenever we write this kind of code, we break the original html template into smaller chunks. Therefore, it is understandable that designer don't like to maintain jsp file. They are meant to be looked at by developers not designers. To avoid inserting opening and closing of for loop at different places, we can use jsp tag. Then, we have another issue with the html code go missing in the jsp file. There is no clean and easy way for us to represent this jsp contents to designers. If there is a minor change to be made to the web interface, it normally comes as an UI patch request from designers. Even for developers, thing does not go well if you are not the author of the code. It may take guess work to find out the code that being executed when user clicks a button, unless you know the convention. The Css selector is too flexible. It allows one developer to define behavior in a non-deterministic way and let the other developer go around searching for it. Directive helps us get rid of both problems. The directive data-ng-repeat="owner in owners" is inserted directly to the html tag. That make it is easier to keep track when the loop actually end both for us and the designers. The html inside the div remained similar to the original template, which make minor modification is possible. For tracking purpose, seeing ng-click directive on the html tags tell us immediately which method to look for. The ng-controller directive or the routing configuration gave us clue which controller that the method should be defined in. That make reaching source much easier. Finally, the AngularJS team allow us to define our own directive. This is amazing because it allows us to create new directive to solve un-foreseen circumstance in the future and tap into existing directives library created by community. Let get ourselves familiarized with custom directive by this example. In our Pet Clinic app, clicking some links on the banner will scroll the page down to respective part of the website. For us, the last one is the best. The directive is a familiar concept for any designer, as they should have used class, id, name or onclick. Having a new well meaning directive will not be that hard to pick up even for a designer. For us, it is fun and cool. We are no longer depend on World Wide Web consortium to release the feature that we want. If we need somethings, we can hunt for the directive, we also can modify it or create it our selves. Slowly, we can have a community-backed directives library that forever improving. After AngularJS presentation, I think not every folk will be ready to jump the boat. The AngularJS deliver so much magic with a big trade off that you need to relinquish the control of your application over to AngularJS. Instead of having work done yourself, you need to provide information for AngularJS to do the work. Two-way binding, injection of services all happen behind the scene. When we need to modify the way it work, it is not so convenient to do so. For us, relinquishing control to build an configurable application is tolerable. However, not able to alter the behavior when we need is much less tolerable. This is where Spring framework shines. It does not simply give you the bean, it allow you to do whatever way you want with it like executing bean life-cycle functions, injecting bean factory or defining scope. Up to this point, I hope you already have some ideas and can make a choice for yourself whether AngularJS is the right choice. To contribute to your decision making, I will share our answers of the questions we received in the presentation. Is it possible to protect confidential data when you build web interface with AngularJS? For me, this is not AngularJS issue, this is how you design your Restful API. If there is something you do not want users to see, don't ever show it on your Restful API. For a Spring developer, this means avoid using entity as @ResponseBody if you are not ready to fully expose it. At least, put in some annotation like @JsonIgnore to avoid the confidential fields. How you pass object around different pages? There are many ways to do so. Each page have its own controller but the whole application share a single rootscope that you can place the object there. However, we should not use rootscope unless there is no other way. Our prefer solution is using url. When user route to the owner detail page, the controller load the owner again from the id in url. It may look redundant but it allow the browser bookmarking. Is this really possible for designers to commit to the project? Yes, that what we have tried and it worked. One day before the presentation, our designer, Andrew redesign the landing page without our involvement. He kept the all the directives we put in and there is no impact to functionality after the design changed. Should I adopt AngularJs 1 or wait until AngularJs 2 available? I think you should go ahead with AngularJS 1. For us, AngularJs 2 is so different that it can be treated as another technology stack and support for AngularJS will continue for at least a year after AngularJS 2 is released (slated for 2016) We feel that due to community support, AngularJs 2 will continue to thrive like Play framework 1 after the release of Play framework 2. So, we have done our part to introduce a new way of building web interface for Spring framework user. We hope you are convinced that Restful API is the way to go and AngularJs is worth trying. If you have any other idea, please help to feedback.